We offer several different options for TV Mounting. Basic installation includes proper mounting on either a frame or block wall. We can also hide those ugly wires in the wall for you for an additional fee. A few things to keep in mind when planning for your TV Mounting: You should supply the mounting bracket of your choice based on the size of your TV and based on the way you want it to adjust. We recommend one that adjusts away from the wall for ease of connecting and disconnecting wires without having to dismount the TV. On a frame wall we will get your TV as centered as possible within the framing stud spacing in the wall. When we hide wires in the wall keep in mind that the wires enter the wall behind the TV then come out of the wall below, near the outlet and cable jack. When deciding the height placement of your TV, keep in mind that all wires must be long enough to reach either the outlet, cable box, DVD player, gaming console etc. Purchase longer wires if needed. If you prefer a truly wireless look then consider a smart TV that doesn’t require any cable connections. Floating shelves help provide a somewhat wireless look however, from our experience most floating shelves are not deep enough to accommodate the cable box without hanging off the edge. For a wireless look we recommend either a smart TV or using a wall mounted media console below. Media consoles come in different sizes, styles, and colors. If you choose to use a media console we recommend that you have it available the same day that we install your TV so that we can align the wires with the openings on the back of the media console. 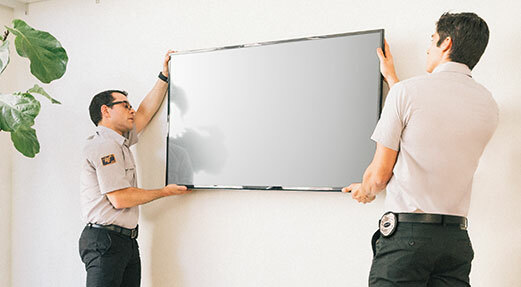 If you have any questions regarding TV mounting please give us a call.